I’ve been delinquent in letting you all know about three awesome new books out in the last few months, all from devoted friends of the Church of Craft. 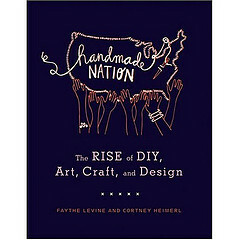 Firstly: Faythe Levine’s companion book to her forthcoming documentary Handmade Nation! Gorgeously illustrated by the talented Kate Bingaman-Burt, including essays by Yours Truly, Andrew Wagner, Garth Johnson, Susan Beal and Betsy Greer, and is co-authored by Courtney Heimerl. The documentary and the book follow the rise of DIY culture over the last 10 years. If you are familiar with or new to the Craft Scene this is an inspirational taste of the crafty lives Faythe has documented. And Betsy Greer‘s essay finds full bloom in her new book Knitting For Good. This book has lots of personal tales of a craftily considered life, in addition to great patterns you can knit for yourself or for charitable giving. 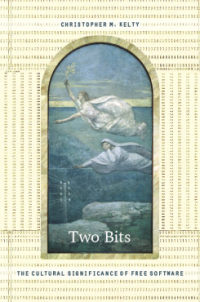 Last but certainly not least is Two Bits, from our very own Parson Chris. Who is this dude who devotes so much unpaid time to make the Church of Craft website look and work so smashingly? Well he is a really smart guy who studies and teaches about humans and information technology. This book is all about free software. He says it is really all about craft. Get them at your library or wherever you can afford to get books these days!! This entry was written by tvecallie, posted on November 30, 2008 at 2:07 pm, filed under All Chapters, New York and tagged book, craft, craftivism, film, free software, friends, handmade, knitting, resources. Bookmark the permalink. Follow any comments here with the RSS feed for this post. Post a comment or leave a trackback: Trackback URL.